We recently came across an article sent to us by our distributor, Braas Company, on Scott Joesph’s Orlando Restaurant Guide about an interesting new way of dining in Orlando at Gary’s Seafood Specialties – the area’s leading provider of fresh fish and other gourmet food items to restaurants in Florida and around the country. At Gary’s, they take in whole fish and process and package them to orders throughout the U.S.
A few weeks ago, SJO reports that they hosted their first Pop-Up Restaurant event, where they cooked and served dinner right there at Gary’s plant, where just house earlier the room had been full of fish guts and scraps from processing (Of course, the room was cleaned by the time the guests arrived). 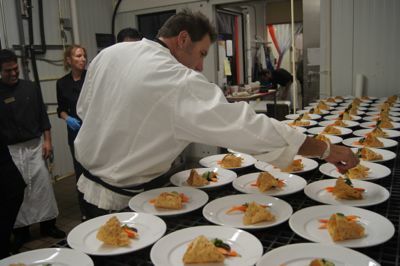 The guests were taught how to fillet a fish and by one of Gary’s master cutters and learned about the process before taking their seats for a delicious gourmet meal. Aside from the unique pop-up restaurant idea, the reason this article caught our attention is their use of AquaPruf 7600 Ultimate conveyors. The makeshift dining room is usually where fish butchers cut the fish on long stainless steel tables and throw the fish carcasses and scrap onto our conveyor, which is sandwiched between two tables, for a trip to a waste hopper at the end of the conveyor. You can see the blue positive drive conveyor belt in some of the pictures. The reason an AquaPruf Ultimate conveyor was the right conveyor for this environment is its USDA approved sanitary design. AquaPruf Ultimate conveyors are designed, end-to-end, specifically for fast, easy, and EFFECTIVE sanitation in food process environments. It’s always fun to see how conveyors are used in so many different ways.